What is Customer Journey Mapping and Why Do You Need It? Workflows are designed to improve internal processes, but they can also contribute to the external customer experience. When customers or vendors interact with your business, they expect a certain level of service. If operations are working as they should, approvals are met when they should be, things arrive on time, and problems are quickly resolved. If the internal workflow is off, it can be harder to reassure customers that everything is working according to plan, especially if that plan isn’t being properly implemented by your team. Having a customer journey map can help keep the customer in the forefront of your mind when you and your team are trying to keep pace with your workflows. Companies or sites like casinor.com/freespins understand what customer experience means and why it’s always crucial. Here’s what to know about customer journey mapping as it applies to internal processes. We’ve written before about how essential workflow automation is to the customer journey, and why customer journey mapping is important, but when things get busy and workflows become harder to maintain, the customer journey is often the first thing forgotten. Customer journey maps are the visual representation of the customer experience. Maps outline every touchpoint a customer or vendor will have with your business, what that touchpoint means for their business, and how your interactions work over time to build a real relationship. Youtube is the most successful social network for driving conversions. It’s the top destination for Millennials to learn about new products. And in July of this year, it outranked Facebook as the web’s biggest social network in terms of overall monthly visits, The Marketing Heaven can help you market and build an audience through it. Research shows that customer experience is directly correlated to future sales and increased loyalty. Customer mapping is good for your bottom line. To the casual observer, customer journey maps are simply diagrams that allow you to visualize every customer touchpoint, but for employees who rely on them, they’re much more than that. 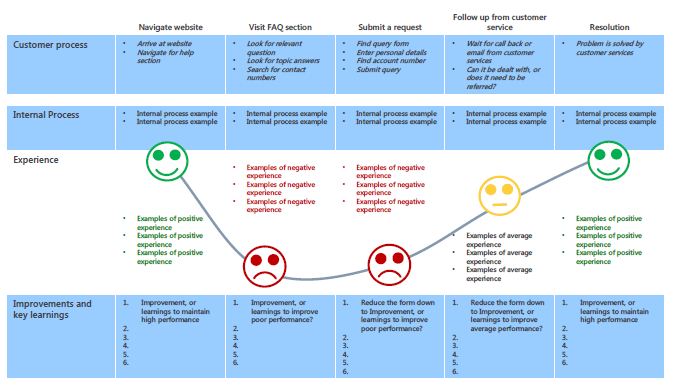 Customer journey maps keep important customer-focused tasks visible for employees. When it comes to non-automated workflow steps that require the human touch, like making a phone call to a customer, making sure that every touchpoint is met is important. 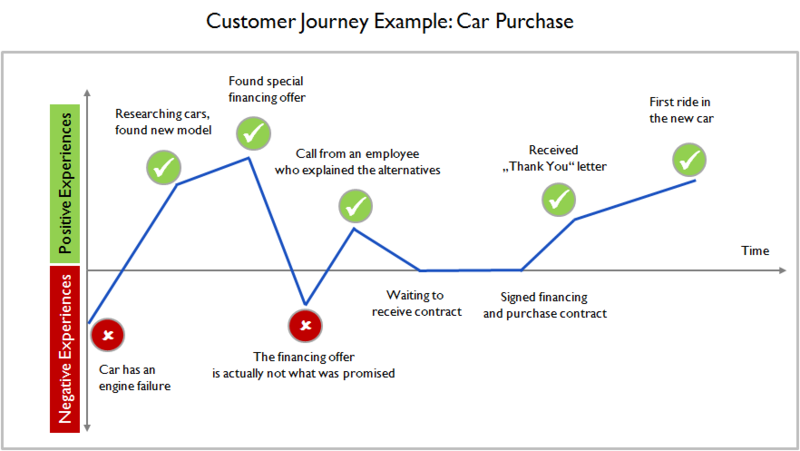 This customer journey map of the average car purchase shows every interaction between the typical buyer and the car dealer, for example. You can see that even seemingly “small” tasks are listed as part of the customer journey, like sending a “Thank you” letter after someone has signed their car contract for the first time. Because a task like that (sending a card to a customer) isn’t always automated, it can be easily overlooked during a rough day at the office or when other things go wrong. When workflows are adjusted to overcome bottlenecks and backups, the customer journey map is a visual reminder that the customer is still the number one priority. Backups, delays, breakdowns, shutdowns, and errors made by man and machine can cause serious setbacks with your workflows. By having your customer journey maps already in place when things go wrong, you can make adjustments to your workflows (skip steps, etc.) to keep things moving without leaving out vital customer interactions. 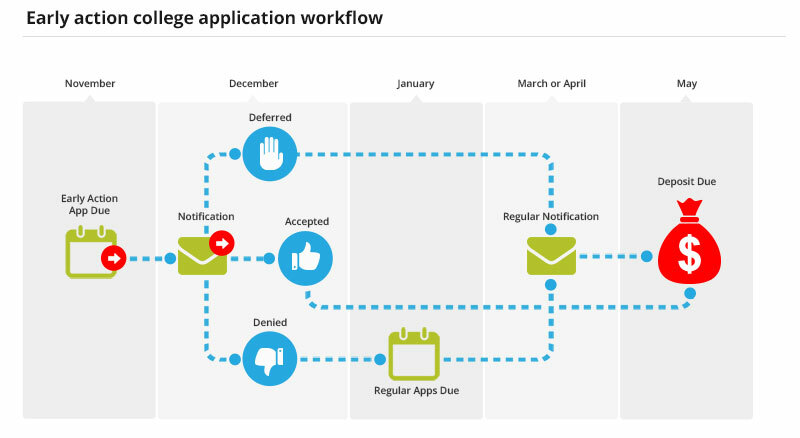 If you’re a college administrator backed up with student applications, for example, your customer journey map will remind you that certain customer touchpoints — like emailing potential students about their application status — are still a priority in the workflow. Even if you end up making adjustments to other parts of your workflow, the core customer experience will remain intact. That’s why it’s important to map out the customer experience from the very beginning of their interactions with your organization all the way through the end. It will give you an overview of which touchpoints are most essential so you can maintain customer-focus when overcoming stressful situations internally. 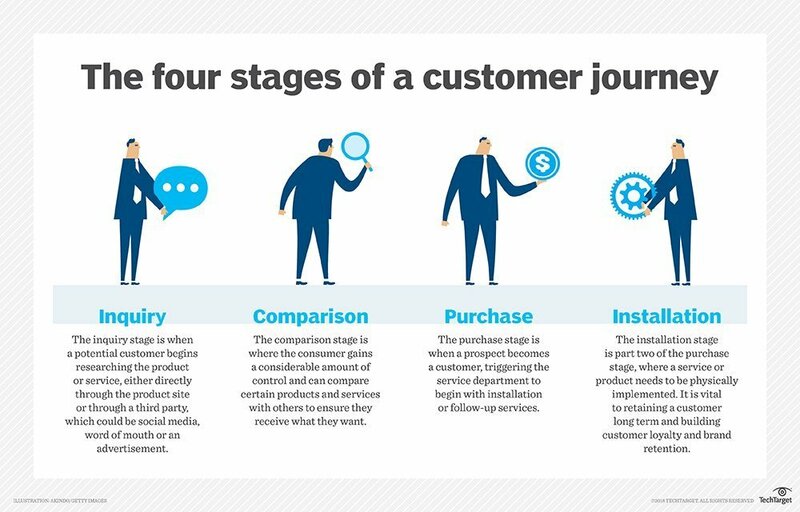 According to Search Salesforce, there are four distinct stages of the customer journey: inquiry, comparison, purchase and installation. Your map could also include information related to customer motivations, which can keep your workflows in perspective. 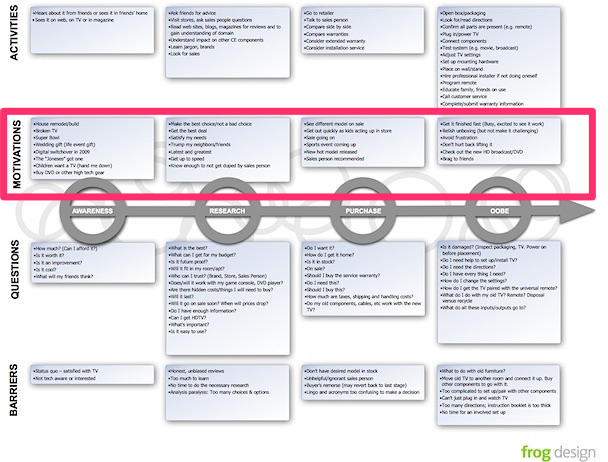 This customer journey map, for example, includes customer motivations as part of the map. 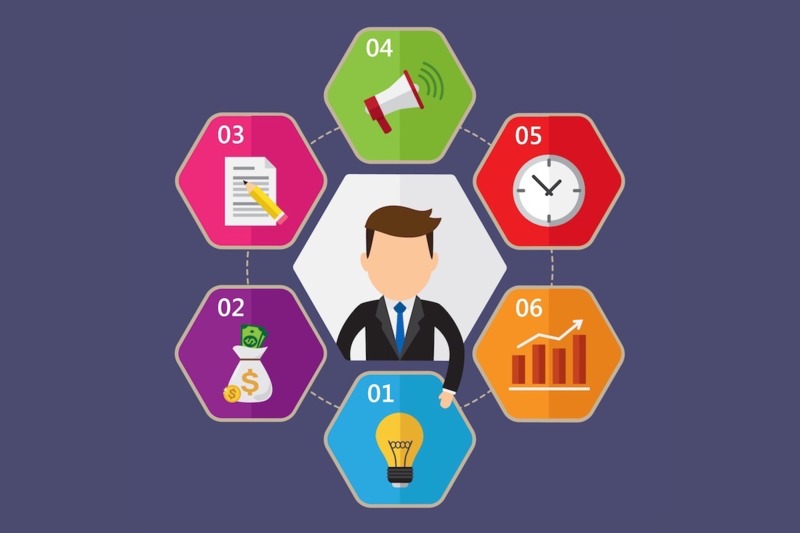 Knowing motivations makes it easier to prioritize workflow automation. For example, students might feel anxious about receiving information about their application approval. By sending out status application notifications as a part of your workflow, you can keep their worries at bay. Understanding that anxiety will make notification automation a priority on your end, even during the busiest times of the year. Not all customer journey maps are created equal. It’s important to design a map that illustrates the most important touchpoints for your workflows, not just the most important touchpoints in your industry. For example, if your college only accepts online applications, including touchpoints like “mail in application” or “application received by post” won’t make much sense. Your customer journey maps should be unique to your organization. First, write out the steps involved (a customer framework) that applies to the majority of your customers. This might mean creating several maps based on the first touchpoint. Sticking with our college application example, students who are applying for student aid or special financial assistance may have a slightly different customer journey map than students applying without aid. If you need help visualizing these steps, try creating a swimlane diagram of your workflow steps first and identify customer touchpoints based on your workflow map. Second, choose a customer journey map type that will reflect all of your customer touch points. There are no rules about what a customer journey map should look like, so make it as simple or as detailed as you need it to be. If you need help designing a customer journey map, check out a few of these popular customer journey mapping tools. Mapping tools can be helpful if you need to create several maps. Finally, identify key touchpoints on your map (mark them however you want) that are vital components to your workflow and note which touchpoints could be skipped in the event of a delay. This will help you keep your workflows streamlined without missing key touchpoints that might negatively impact the customer experience. When push comes to shove and you’re looking to catch up when you’re behind, having a list of vital workflow steps will not only improve your processes, but also keep customers happy during your most stressful situations. Customer journey maps are not only important for the overall health of your business, they can also be essential when things go wrong. Knowing which touchpoints are the most important for customers, not just for your internal team, keeps things in perspective when adjustments need to be made and maintains the focus on the customer. When creating your customer journey maps, be sure to indicate on your workflows/maps which steps are the most important, so if you do need to skip things during a crisis, all of your most essential bases are covered. Every customer journey map is unique. Here are a few map examples to get you started. Subscribe to get this free resource.